Currently, constructions of bamboo are still made empirically, based on the results of load tests on test pieces. In this research, the technical feasibility of constructing a four-floor building with bamboo as the main material of the self-supporting structure was verified. Tests confirmed the good resistance of bamboo’s compression parallel to the fibres, enough to be used as columns. However, bending tests and compression perpendicular to the fibres showed the inadequacy of the material when subjected to these efforts. The idea was developed of a composite material of bamboo filled with concrete, which after the results from laboratory was allowed to be used as the beams of the building. It has been proven throughout the development of research that bamboo is an alternative material for construction and besides having good physical and mechanical characteristics it is a material that enhances sustainability. With the aim of ensuring environmental sustainability in construction, a mixed material was developed, composed of bamboo and filled with concrete, combining the advantages of both materials in a single element. In general, the bamboo constructs are still made empirically based on the results of the field load test. These buildings tend to conform more to traditions beliefs and criteria established by professionals, than to standards calculation or mathematical models for structural analysis. 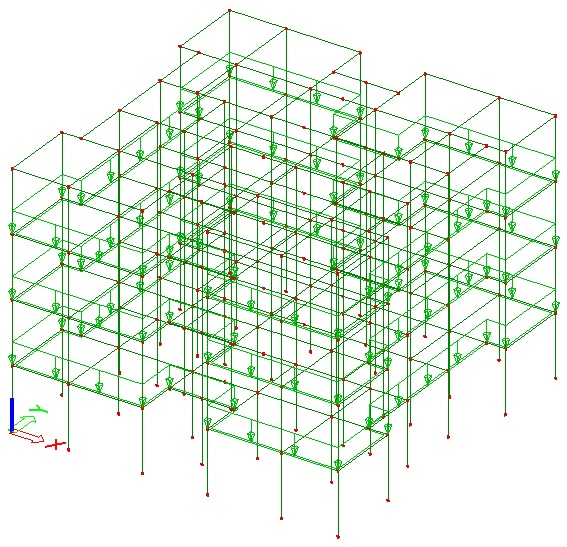 Therefore, in order to simulate the behaviour of these structures we chose to model a building of four floors in SCIA Engineer structural analysis software developed by the SCIA. The performance of experimental research was essential for defining the characteristics of bamboo filled with concrete. By means of tests in the laboratory of the “Instituto Mauá de Tecnologia”, we studied the mechanical behaviour of the composite to bending, compression and shear, adjusting the physical and mechanical properties together with parameters of the input for SCIA Engineer. C25/C30 concrete was used with the physical and mechanical characteristics stipulated by the European standard Eurocode (EN 1992). To simulate the characteristics of bamboo the woods were chosen as the base material, once the bamboo had different behaviour in relation to the position of the material fibres. Through literature and testing developed by the authors, the physical and mechanical properties of bamboo were stipulated. The default values adopted for the bamboo poles were 15 cm in diameter and 1.50 cm thickness. Structural Model The model includes a 3D portico, with four floors composed of bamboo stick pillars, and bamboo beams filled with C25/C30 concrete. 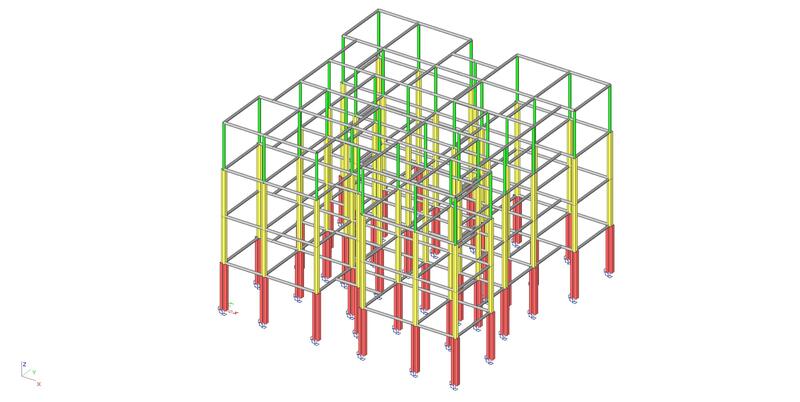 The usual design procedures were followed, respecting the precepts of technical standard NBR 6120: “Loads for the calculation of structures”, aimed at simulating the loads of dead weight of the slabs, closing masonry, dry-wall and overhead of utilisation. Loading due to wind was not considered, as it is a structure with high rigidity, low overall height and a great number of pillar rows. The self-weight load was applied automatically by SCIA Engineer, taking into account the specific weight of the materials used. All the loads, both permanent and accidental, were increased by 1.40, according to NBR 6118. 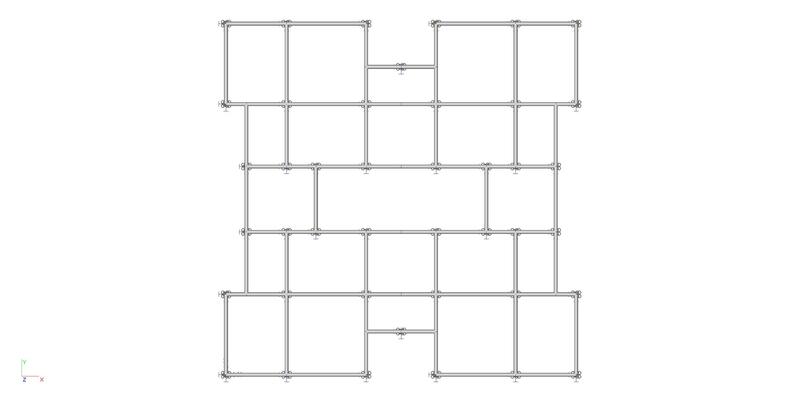 Through the internal forces in the bars, from the structural analysis developed in SCIA Engineer, the bars more requested were verified by applying criteria of strength of materials to normal stresses and shear stresses. All bars met the verification criteria, making it possible to state that a four-floor building made of bamboo is technically feasible. The bamboo has good compressive strength, enough to be used in the columns of the building. However, the beams require sections of bamboo filled with concrete. 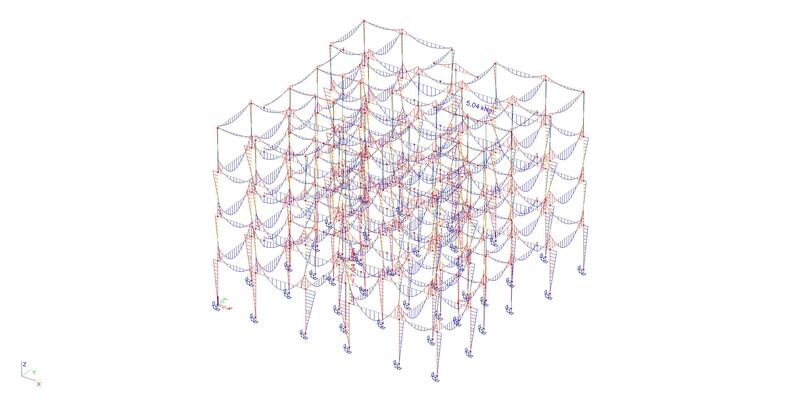 The bamboo is efficient in normal forces, both traction and compression, hence its use in truss structures provides better utilisation of its resistance, but does not exclude other structural models, such as those presented in this work. It has been proven throughout the development of the research that bamboo is an alternative material for the construction industry and besides having good physical and mechanical characteristics it is a material that enhances sustainability.